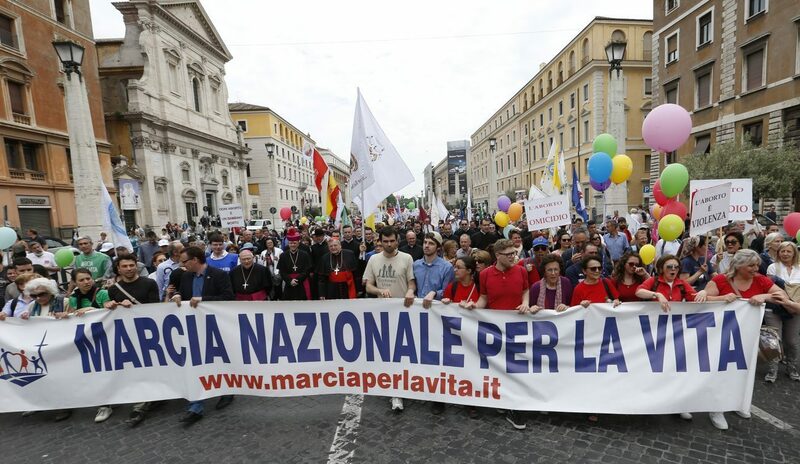 ROME (CNS) — People from at least two dozen countries joined Italians May 8 for the sixth annual National March for Life in Rome. Carrying multicolored balloons, crucifixes or children, the estimated 30,000 people walked through the historic center of the city and joined Pope Francis for the midday recitation of the “Regina Coeli” prayer in St. Peter’s Square. The pope greeted the marchers, who were led by U.S. Cardinal Raymond L. Burke, patron of the Knights and Dames of Malta; Archbishop Luigi Negri of Ferrara-Comacchio, Italy; and Auxiliary Bishop Athanasius Schneider of Astana, Kazakhstan. Organizers said more than 100 pro-life and pro-family organizations participated, including dozens from 29 countries besides Italy. Although the march is not sponsored by the Catholic Church or a particular Catholic group, hundreds of priests and religious joined the marchers. The marchers carried signs not only urging an end to legalized abortion, but also urging Italian lawmakers to reject proposed legislation allowing euthanasia and a bill — further along in the legislative process — that would recognize civil unions of unmarried heterosexual and homosexual couples. Before greeting the group, Pope Francis spoke to them and to thousands of other visitors about the feast of the Ascension, which was celebrated May 5 at the Vatican and May 8 in Italy. “After having seen their Lord ascend to heaven, the disciples returned to the city (Jerusalem) as witnesses who with joy proclaimed to all the new life” that came with the death and resurrection of Jesus, the pope said.